I looked idly down at the night’s playbill, wondering who was up next. Special Surprise Contender it said. The club was dark and smoky. There was no action in the ring – it was between rounds. The low hum of conversation at the small tables clustered around the ring was strangely muted. Out of the corner of my eye, I caught a slight movement in the far corner of the room. A subtle shifting in his bulk and I noticed him for the first time. Jabba The MAB. I looked down at the playbill again. Special Surprise Contender. It couldn’t be him. My heart thumped faster, harder as I motioned to the waiter. He strolled over. “I see Jabba over there. Why is he here? He’s not on the program. He’s not going in tonight, is he? The other opponents were knocked out.” I spoke quickly. The waiter just shrugged, boredom etched in every movement, every line of his face. The waiter motioned subtly and two, burly bouncers started for our table. “No, no, I just need to talk to the manager. You see, I know him. That’s an alias; Jabba the MAB, the Mysterious Abnormal Blob. But I know him. I’ve seen him before.” I was anxious, pleading. If I could just explain. The bouncer bent low, murmured something in my ear about not having any trouble. I got angry then. “Who’s in charge here? I want to speak to the manager.” I thumped the table with my fist. They each put a hand on my shoulder then, starting to raise me from my seat. It can’t be him goddammitgoddammitGODDAMMIT! They reached the door and started to push me through. Over one bouncer’s shoulder I caught my sister’s eye for a split second. She smiled sweetly to me from her corner in the ring, her face calm, her eyes full of love and faith. Then I was outside, the asphalt of the alley rough under my cheek. A single, dim bulb over the club door did nothing to compete with the surprising brilliance of a night sky filled with stars. I wasn’t screaming now. I looked at the stars and whispered a single prayer; so faint it was not really sound. This entry was posted in Cancer Schmancer and tagged cancer, family, life, musings, postaweek2011, writing. Bookmark the permalink. Love and prayers. That’s all I can offer to you and it feels so empty via Internet. But sincerely – I’ll be praying. Thanks Jackie, I really appreciate that. Oh my goodness. I am sending healing vibes to you. Gosh, this has just got to be so hard going through this again for your family. Continuing to pray over here. I was glad to hear that Libby came through the biopsy procedure ok (other than complaining about her hair) and I hope that once the results come in the treatment options are good ones. Where’s that bouncer?! 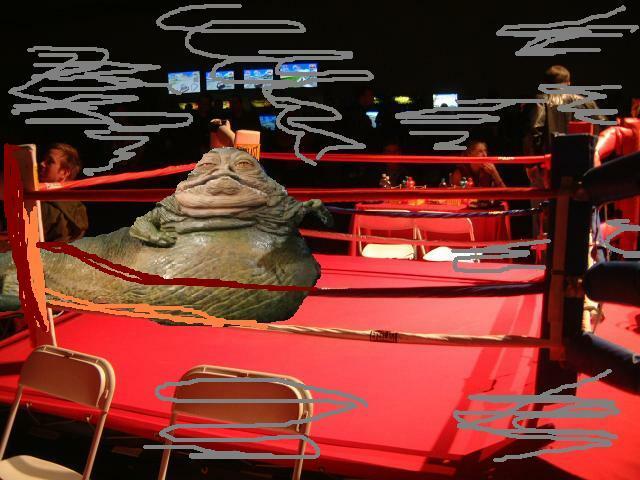 Jabba needs to exit the building. NOW! Thanks Cheryl. Lib is blessed to have such good friends as you and the “gang”. Lib can take him – he may be ugly, but she’s stronger than she looks. I hear the Rocky theme playing in the background (that’s always a good sign). The “Feeling Strong Now” 1st movie theme or the “Eye of the Tiger” from the Dolf Lundgren movie? Cuz I always thought the scene with him lifting that troika with Adrian and the coach in it, somewhere in the snowy wilds of Russia, was the hokiest thing I ever saw. Gag me! “Feeling Strong Now” and I did not see the other movie, though it sounds like something my husband and son would watch with the volume turned up to some deafening level. I think I’m getting the sequels confused, anyway. “Eye of the Tiger” may be from #3, not #87. Your menfolk are sure to know. Your writing is powerful. And so are prayers. Saying one right now and sending e-hugs to you and yours. Thank you, Paula. People are very kind. We’ll be praying… a lot. Just home from BC. Your writing, so powerful, evocative, scary and REAL. I think this speaks to what every member of our large and loving family feels. Like a sucker punch in the gut that gets numb for periods then flares up again. Gotta stay strong and work on my own faith. MK turned over the reins at lunch today. Lib had a busy day; errands, lunch and a visit with Ann D. Bought the supplies and cleaned the toilets, as instructed by MK before she left, so all’s good in the hygiene area. Took her to M&Ds for her sleep over :), a quick visit, then home for an early day tomorrow with Pat’s Dad: Easter mass and brunch at our house. Another excellent piece, Peg! Prayers being cultivated from all around the globe. Love you too, Tar. We’ll work on calmness and faith, OK? Happy Easter to your family! Beaming Love and Light to you, your sister and family. I feel your anger and it is totally unerstandable. Lib is so fortunate to be surrounded by such a large, loving family. Please know that you, and Lib and your family are in our thoughts. Peace and love to you all. You, me – we are very blessed to have families who love us, aren’t we? I appreciate all your support and good thoughts. Hey, bigsheep said she could hear the Rocky theme song, which means you will be victorious. I mentioned Dolph from the 121st Rocky movie, and forgot all about Dolph, your tough and virile pillow pal. This must mean something! Not sure what, but something, right? sending prayers your way..sorry to hear this. I appreciate the kind thoughts – thank you. Brilliant Peg! We are all praying for Lib and all of your family. Jeanne! So great to hear from you. Thanks for the prayers, and best wishes to your family, as well. So many thoughts running through my head after reading this…yet it took me ten minutes to find a way to express only some of them. You have a gift with your writing. To others and to yourself, for I know how well it can be to get these feelings out through writing. I am so full of emotion for you right now because of your words–they’re powerful in their expression. Thoughts of my own brother who my sisters and brother, my mom and dad, lost to a brain aneurysm after three brain surgeries and weeks in the hospital rush through my heart and head again. Keep holding on, one foot in front of the other, and keep the faith. I’m going to do what I do best—pray. It’s a unique type of loss, a sibling, isn’t it? On a purely selfish note, you lose a part of your childhood. Just stupid things. When the “remember whens” come up, as they often do in a close family, you say “who was that teacher? Pat had him.” and there’s no answer, because he’s not there. Our brother died when he was 35. Mine died when he was only 39… way too young. He left behind a son and daughter who are around the same age as my own children. That was in 2003, but seems like only a couple of years ago. We just have to keep on living. I just re-read your post about Lib’s MAB. It touches me every time I read it. Thanks my sister. Now read something fun and upbeat!